Today I graduated to soft foods. I can’t begin to describe how excited I was for today to get here. Today meant that I got to resume my vitamin regimen, which I had missed for the past 3 weeks while on full liquids–before surgery, I took a multivitamin, B12, vitamin D and calcium supplement every day without fail. So to go without them for 3 weeks was tough because it threw me out of my routine, plus I had really low energy levels, I think because I wasn’t taking my usual battery of supplements. Thankfully, post-op, they’re all the same ones just in a different form so getting back to my old habits vitamin-wise hasn’t been difficult. But the most important part of today is that. I. Graduated. To. Soft. FOOD! For the past two weeks, I have wanted to bite into food so badly I could taste it. That first week after surgery, I couldn’t even think about eating–I was so focused on drinking and avoiding dehydration that food was the last thing on my mind. But the more protein drinks I had to drink, and the sweeter they seemed to become, I could hardly wait until I was cleared to have soft foods. So what did I choose as my first soft foods? 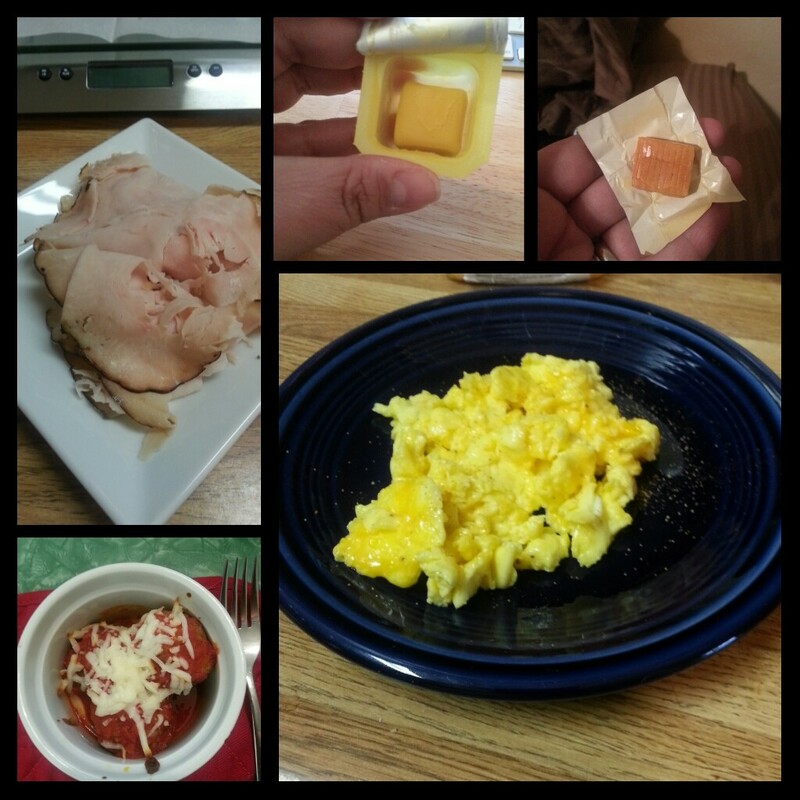 Counterclockwise, from upper left: thinly sliced Boar’s Head Maple Turkey, Trader Joe’s turkey meatballs in Lidia’s marinara sauce with a sprinkle of part-skim mozzarella, the most epic scrambled eggs that I have ever eaten, a Celebrate Soft Multivitamin Chew, and a Calcet Creamy Bites calcium supplement in Lemon flavor. I didn’t do too badly for the first solid food I’ve had in 3 weeks. I will admit, my doctor’s plan advised me to try applesauce and oatmeal first as they would sit better in my new stomach. I was so tired of the taste of sweet (thanks, protein drinks!) that the thought of eating applesauce repulsed me. So this morning after I got up, showered and took my meds, I tried out my multivitamin of choice, Celebrate Vitamins’ Soft Multivitamin Chew. I bit into it and chewed it carefully, into a paste, as my dietician had advised me. I waited a couple of minutes to make sure that it stayed down, and then repeated the process for the other half of the chew. Satisfied that it didn’t send my tender new tummy into revolt, I decided to fix my breakfast. I’d already decided that I was going to have a scrambled egg for breakfast. I’m a savory eater for breakfast–I have never been much for pastries and cereal at breakfast time. Give me eggs and meat and cheese and I’m happy. Initially, I’d planned to use my muffin top pan to fix a mini omelet in the oven but I was advised by several folks to soft cook the egg rather than hard cook it as the egg would be too firm and thus a bit tougher to keep down. So I decided to scramble the egg with a bit of cream and cheese to soften up the texture a bit. This morning’s breakfast was perfect. I think the best part of it all was that because I’d been waiting for so long to have actual food, this was the absolute best scrambled egg I’d ever had. It seriously was the best egg in the history of egg-dom. After I cooked it, I sat down at the kitchen table to enjoy the fruits of my labor, taking care to take tiny bites. This is what a bite looks like for me now. Just the tip of the spoon. It gets chewed anywhere from 20-30 times. Taking bites this size and chewing them thoroughly is important because my new stomach’s diameter is roughly that of my esophagus (until you get to the bottom, where it is wider). My sleeve was crafted with the smallest bougie my doctor uses (32F), so I will have great restriction. One of the reasons I wanted to start with a protein rich food rather than applesauce or oatmeal is that I wanted to learn quickly what restriction felt like. And boy did I learn! When I was getting close to the end of my meal, my stomach started to feel a little “heavy” and the moment I felt that, I knew it was time to stop eating. I knew that if I pushed it and continued to eat that I would throw up and I definitely did not want that! I also began to burp, which was another sign that I needed to stop. I also tried to follow some of the best advice from vets I’ve heard: undereat your sleeve’s capacity. The principle here is that you should not eat until you’re full; eat until you are satisfied. So that’s what I set out to do. It took me about 35 minutes to eat about 3/4 of my breakfast. While I ate, I tried to be very mindful of what I was eating. I took care to pay attention to my plate and to the act of eating. I put my phone away and didn’t have anything to distract me from my meal. I also made sure I put my spoon down in between bites so that I didn’t shovel in my food. I counted chews in my head, taking care to chew each tiny bite thoroughly so that when it went down, it went down as a paste. I savored each bite as though it would be my last. They seriously were the best eggs I have eaten in EVER. I am pretty sure this will become a staple breakfast for me as the school year begins. I served breakfast up on a salad plate. Putting it on a regular dinner plate would have been silly. Heat the oil in a nonstick skillet over medium heat. 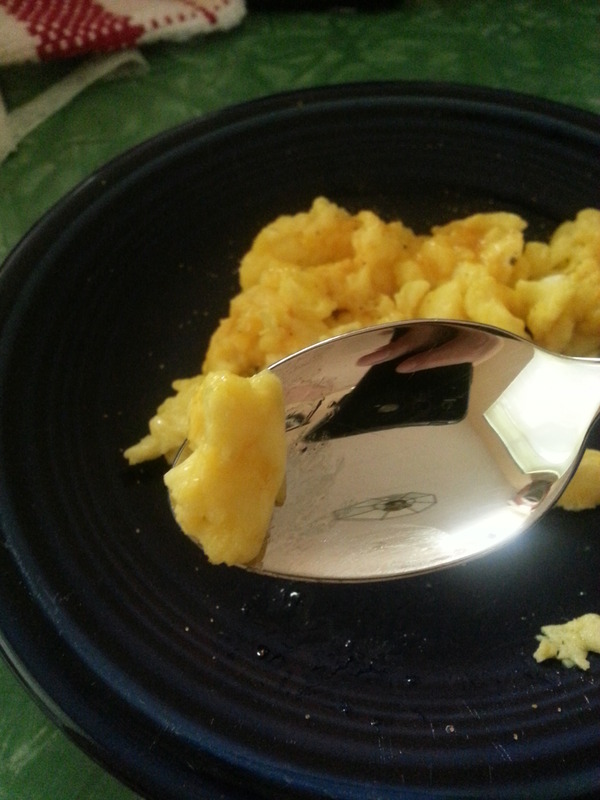 To make the egg have a custard-like texture, you are going to cook it low and slow and stir it constantly. While the oil is heating up, crack the egg into a bowl and add the cream. Scramble the egg with your choice of kitchen implement (I use a fork, some like whisks, use what you like) and add pepper to the mixture. When scrambling the egg, take care to make sure the yolk and white are fully incorporated into one another. When the oil in your skillet is hot enough, pour the egg in and stir it around the pan. Don’t allow the egg to set up–remember, you are after a custard-like texture, so you want them to resemble something creamy and smooth without being undercooked. Stir in the cheddar cheese and once the egg has cooked through, remove it from the heat and serve hot. 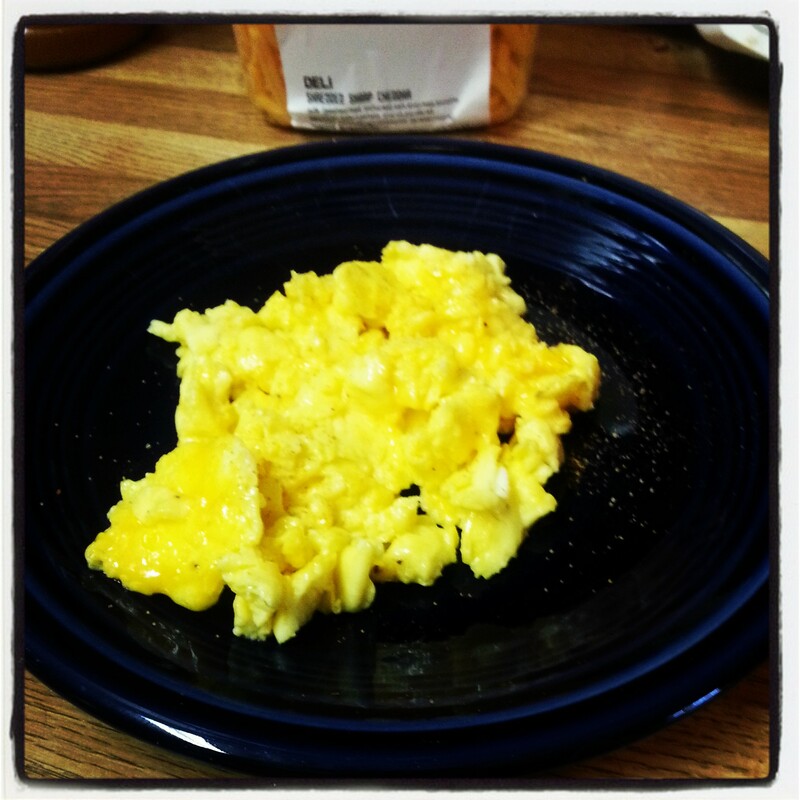 This version of eggs had 106 calories, 6 carbs and 8 fat (from MyFitnessPal). The fat count is a little high because of the cream and oil, but I figure since I’m getting so little fat from the small quantity of food I’m eating this is okay. This entry was posted in eating, post-op, the sleeve, vsg, weight loss surgery and tagged celebrate vitamins, daily bites, eating mindfully, mindfulness, photo post, post-op eating, post-op life, recipes, sleeve gastrectomy, soft foods, vitamin supplements, VSG, vsg realness, WLS. Bookmark the permalink. wow.. such a great narration! I have never been so intrigued on “how people eat” as I am now. It will be a new part of our lives and my old teacher days (eat as fast as you can to get it all down in 10 minutes) has got to go! Can’t wait for tomorrows food choices, directions and pictures (please tell me I won’t be disappointed 🙂 got my Surgery date today! The countdown has officially begun. Thanks! Today was a strange experience indeed. Even though I weighed and measured everything I ate, I found that I could not eat it all. And I’m talking 2 ounces or less! I too am a teacher and getting used to eating in 30 minutes or less is going to be tough so I have to think about how I am going to do lunches each day is going to be a challenge but I think I’m equal to the task. I can’t promise new recipes each day but I will try and document what I eat each day so that you and others who are considering surgery can see what I am able to eat on a daily basis. I am super proud of you ! Can I ask how much you have lost since so far ? When does school start. ? It is going to be so fun to come back after your life changing summer ! Thanks! So far, I’m down 57 pounds as of Sunday. That includes what I lost before surgery due to pre-op dieting. Since surgery, I’ve lost 20 pounds. School starts for me on the 19th, and kids return the next week. I have thought about leaving the classroom for corporate life, but then I think about how much I like working directly with kids and I always reconsider it. Did you have sleeve or bypass? Did your doc say it was ok to eat full fat dairy? I’m at 4 months from sleeve and haven’t integrated fats yet. I did have a small cup of soft serve from McDonald’s and got sick last week so I’m really curious about your diet. Keep up the great work!!!!! I have a sleeve. I didn’t want the malabsorption that the bypass gives you. I do 2% milk when I drink any milk, and small amounts of full-fat cheeses. I am not a fan of fat free dairy because the ingredients needed to make a full fat cheese taste like regular cheese is full of things I’d rather not put in my body. I don’t know that I’ll try ice creams for a long while yet since they’re a slider food. I’m also not so much a sweet eater; I prefer savory foods to sweet so the fact that I’m finally able to eat soft foods is exciting to me because I can have eggs, fish, shellfish, moist ground meats, soft cooked veggies and lean deli meats. Thanks for the compliment! I’m trying to work this sleeve as best I can! Eating at school will be a little tougher for me since I am a science teacher and we always tell the kids “no eating in the lab.” I’ll probably snack at my desk, but that’s about it. I’ve only told a couple of co-workers about my blog but all my co-workers know I’ve had surgery.